We will cover basic modifying commands here. So lets get started. We can access all highlighted commands from Modify Menu or Modify Toolbar. Go to Modify Menu > Copy . From Modify Toolbar click on Copy icon. How to use Copy command? 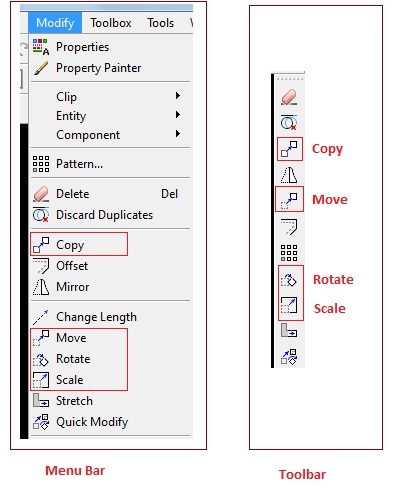 Specify entities which you want to copy either by click selection or window selection. After selecting entities in command line number of entities selected will be shown. Now press Enter/Space key from Keyboard for next step. Specify second point» Select destination point to Copy selected entities. Go to Modify Menu > Move. From Modify Toolbar click on Move icon. How to use Move command? Specify from point» Select Start point in GA. Specify destination» Select destination point to move selected entities. Go to Modify Menu > Rotate. From Modify Toolbar click on Rotate icon. How to use Rotate command? When you run rotate command then Select entity you want to rotate & press Enter. Specify pivot point» Select pivot point in GA around which you want to rotate entity. Specify rotation angle» 30 . Type angle for rotation or click in GA at an angle you want to rotate. Go to Modify Menu > Scale. From Modify Toolbar click on Scale icon. How to use Scale command? When you run scale command select entities to scale and press Enter. Specify base point» Select base point to scale entities. Specify scale factor» 1.2 . Type and enter scale factor or click in GA . So, What if you can do Copy, Move, Rotate and Scale from one command instead of running separate command ? Yes this is possible in DraftSight with Quick Modify (DraftSight 2015) command. This command is available in Paid version only.